McNabs Island gets an annual clean-up, but bigger garbage presents a bigger problem. Meredith Dault reports on new plans for a major island sweep. Rights of refuse-al McNabs Island is finally getting some garbage-removal love. It's a bright April morning on McNabs Island—the sky overhead is a brilliant blue, the Halifax skyline shining in the distance. Still wearing the matching day-glo orange flotation coats they donned for the high-speed boat trip, the group of 14 people clustering at the edge of the water look almost like school kids out on a field trip, waiting to be told what to do. Wearing yellow, their unofficial tour guide, Anton Self, stands out. "Over there are 55-gallon steel drums full of chemical waste," he says, matter-of-factly, gesturing towards the interior, "you can even see green stuff oozing out of them." When they start walking, Self takes the group to a wooded area littered with corroding batteries and scraps of metal, later stopping to point out an old car, recognizable only as a pile of rusted parts at the base of a tree. One of the orange coats snaps photographs. This is, after all, a government fact-finding mission (the media was not invited). McNabs Island has a garbage problem—and it's bigger than the condoms and plastic tampon applicators that regularly make a mess of the shoreline. Though it's mostly a Provincial Park now, the island was once home to a thriving community. Even at its peak, however, McNabs never had formal garbage collection, so stuff—retro washing machines, easy chairs, broken bottles, construction material—would accumulate in backyard dumps and along roadways, where it remains. Self, who owns property on McNabs, made headlines earlier this year when he complained about paying municipal taxes in exchange for "zero services." Garbage removal was high on his list. Although The Friends of McNabs Island Society, a charitable organization dedicated to the island's preservation, holds an annual beach sweep, volunteers can only cart away the stuff that is washed ashore from the harbour. "Any garbage we have, whether it's a can of paint, recyclables—anything that we can't compost or burn—has to be taken off the island ," says Self, one of the island's three remaining private landowners. His backyard is still littered with the garbage he inherited when he bought his property in early 2000, and he's had no effective means of getting rid of it—until now. Self, it seems, has been heard. The group trundling along behind him on the garbage tour represents three levels of government, HRM, the Department of Natural Resources and the Department of National Defence, all of whom have agreed to play a role in the McNabs clean-up. Councillor Becky Kent, whose district represents the island, says she got enthusiastic about the project after being invited to survey the garbage on McNabs with Self and island resident Tony Publicover last year. "I realized, "My god! There's enough here that we have to deal with it!'" says Kent. When they get to Tony Publicover's home, the group stops to marvel at the debris in his yard. There, just behind the house, beside a half-toppled shed stuffed with garbage bags, are two rusting vehicles from the 1950s, their cavities full of junk. Publicover regularly adds to the piles with the garbage he finds lying around the island. It's there that the group stops for an impromptu brainstorming session, led by Kent. The group must work quickly, she says, before spring growth hides the low-level garbage for yet another year. Everyone agrees on a mid-May start date—with a week set aside for the one-time, volunteer clean-up. Representatives from HRM say they can provide trucks and backhoes and the Navy will provide a barge to haul refuse back to the mainland. Though Self commends the city and the province for what he calls an "unprecedented multi-government gesture," he still has questions about what will happen once the clean-up is done. Referencing the fact that McNabs has been largely neglected by the city and provincial government in recent years, Self is optimistic things might be changing. "Hopefully this is a sign of things to come," he says, "and not just a one-time public-affairs decoy." It's clear, however, that Kent is keen. Zipping up her orange coat for the return trip to the city, her enthusiasm for the clean-up project spills out, "I'm just so pleased we're getting it done!" 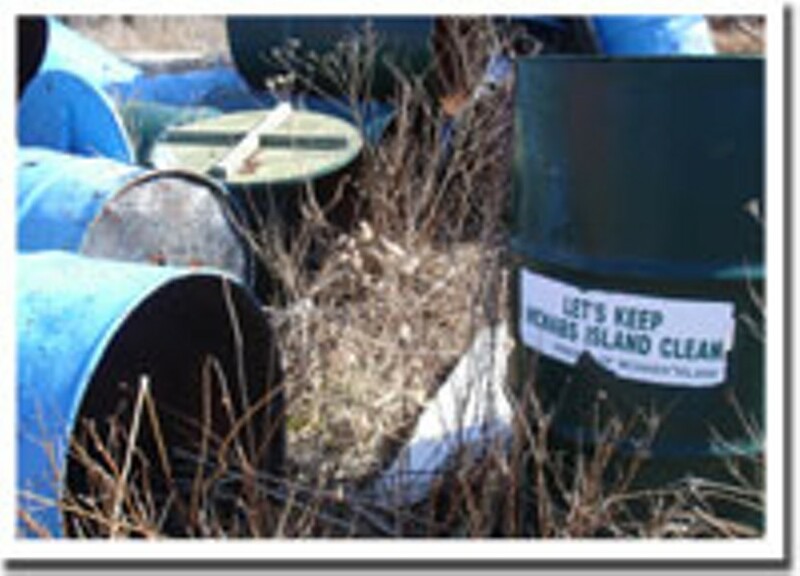 The week-long McNabs Island clean-up begins May 14. Anyone interested in helping should contact Becky Kent at 490-7029.